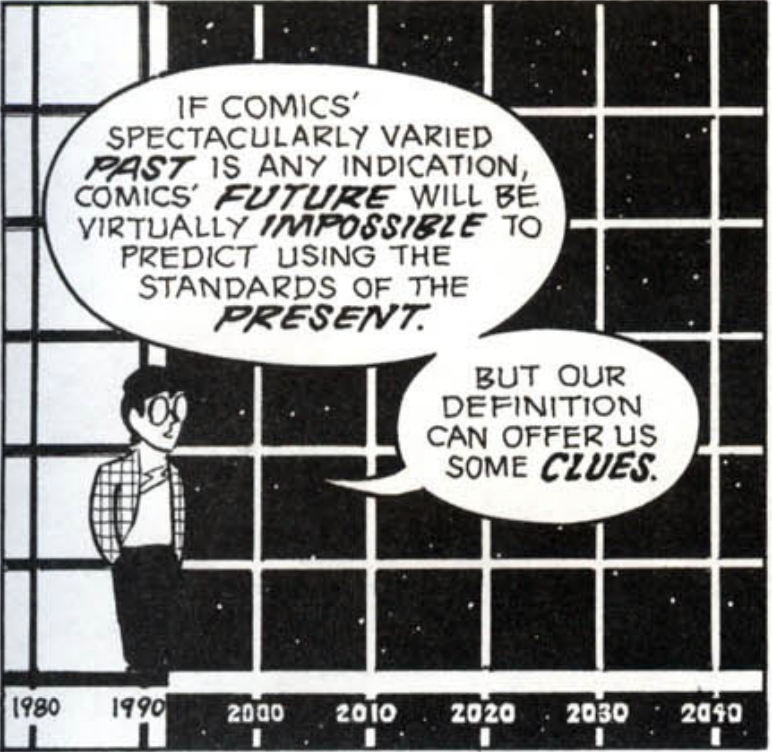 The future of comics – as stated by Scott McCloud in this image, “…virtually impossible to predict” in which I completely agree with. As Scott McCloud also speaks to the incredibly varied past forms of art and specifically comics, he implies that if everything changes so quickly over short periods of time, there is no real way of necessarily predicting what comics will be like in the future. However, in looking at more modern and recent comics (print and digital), I have to believe they will become more of an expression of art such that artist Eroyn Franklin portrays in her comics. In contrast to more classical form of comics such of that styled in Scott McClouds, Franklin uses a far more abstract expression in her imaging and less of the easier to follow sequential imaging McCloud speaks on in Understanding Comics. While Reading Scott McCloud’s printed book, I find it easy to follow, incredibly informative on information I never had quite wrapped my head around with comics, never had I thought they contained as much complexity to them as McCloud described. Maleng 5 on Eroyn Franklin’s web comics. With reading Eroyn Franklin’s web comics, I was amazed by the artistic expression, the abstract work was more enticing to someone like myself because that is my favorite form of art. With that being said I did find it very difficult to follow the story line and which direction to follow the dialogue. If I were to write a comic it would be linked somewhere in between McCloud and Franklin’s work. I find it much more aesthetically pleasing to illustrate the way Franklin did, but it would work much better by decreasing the image size slightly and refining the sequential dialogue in the reading for the readers. I would envision people reading it in print that was slightly interactive as well, where the characters and dialogues folded up off the page to interact with the reader and seem like the book was alive.